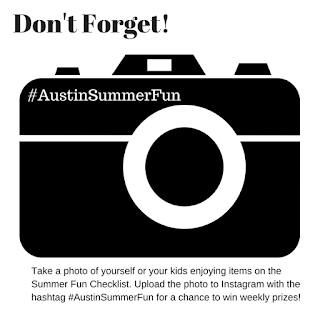 The MetroRail is Austin's commuter train, operated by Capital Metro, that runs on a 32-mile line from Leander to downtown Austin. The first time I rode the MetroRail was in 2012 during the Fan Fest. Because of the popular festival and droves of tourists in the city for F1 weekend, Capital Metro decided to operate MetroRail on an extended daytime schedule that Saturday and Sunday in order to shuttle more people downtown. With the best intentions to move people between the outskirts of Austin to the festival location downtown, the trip on the train was a total disaster. The trains were running late, which meant the hordes of people waiting for the late train had to board with additional hordes of people who showed up for the later train. There were way too many riders on board, making it tough to move, to breathe ... to coexist with other people whilst remaining in a good mood. To add to the misery, I had an 8-month-old baby who was having none of it and promptly melted down about three minutes into the drive. Fast forward three years: that same baby is now a train-loving 3-year old who has caught glimpses of this shiny red and gray train as we drive around town. Deciding to give it another go in the name of being a good mama to a toddler, we planned out a Saturday adventure from the Howard Station to the downtown station. I am happy to report that it turned out much better than our maiden voyage. 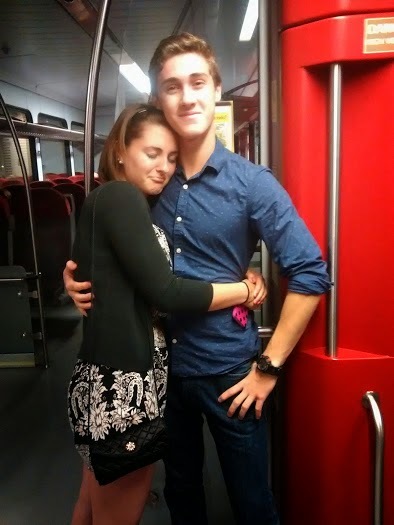 The ride was actually quite perfect and inspired us to take many more journeys on the MetroRail. 1. I can be a passenger. Because I get car sick most of the time I'm in a car, I am almost always behind the wheel. Riding in the train allows me to look at my city from a different perspective, almost like I am a tourist. 2. I can talk to my co-riders without being distracted. I have conversations with my kids or we just stare out the window, each of us lost in thought. But you know what, I'm not driving so it's totally cool to check out. 3. Perhaps this should have been No. 1 on the list: the pure joy on my son's face as he sits in a REAL CITY TRAIN! 4. Speaking of real city, it kind of makes Austin feel really big. We need more trains in more places, Austin. I guess the city is getting big now, eh? 5. It's clean and nicely air conditioned (as long as it isn't overcrowded, ahem). 6. All of my kids, no matter their age, really enjoy the journey on the train. We have three kids: 16-, 8- and 3-years old, and they all love the experience. For a normal night out, adding in this additional travel element makes the experience even more memorable and exciting. While they stood and sat far enough away from us, the uncool parents, my teen and his girlfriend let me get close enough to at least snap a photo. 1. It's kind of pricey. At $3.50 for a full fare ticket (for adults) one way, it can add up quickly for a family. 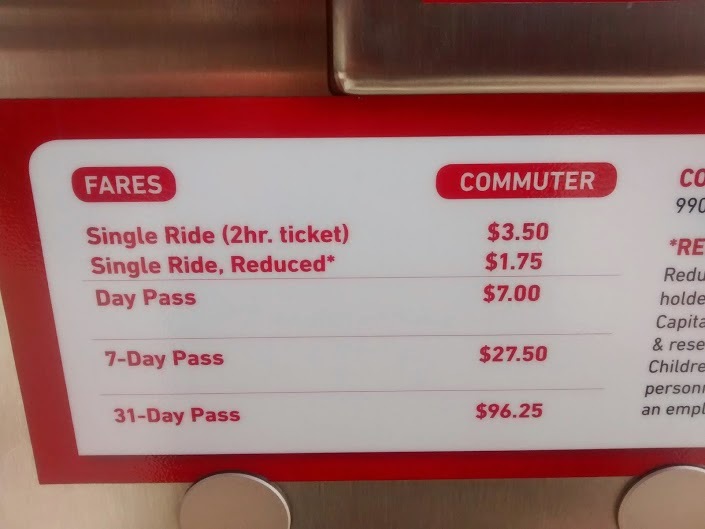 While there are reduced fares for seniors, military and students (6-18 years old), you can still drop some good money if you have a large family. 2. The weekend schedule doesn't start running until the afternoon. I'd love to take the train downtown during the day to hit up a farmers market or hang out at a coffee shop but that isn't an option. Plan accordingly! 3. The weekday trains heading north from downtown stop running way too early. Now I know it's probably a demand thing, but still, it makes planning a fun trip very tough with such time limitations. If we want to take the train into town on a Wednesday for dinner, we have to be done by 6:30 to make the last train. 4. 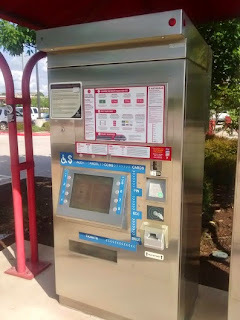 There are no bathrooms at the Park and Ride stations. Have kids? Uh, make sure they go before you leave and cross your fingers they make it to your destination. 5. Ticket machine: It's kind of tough to get the hang of. 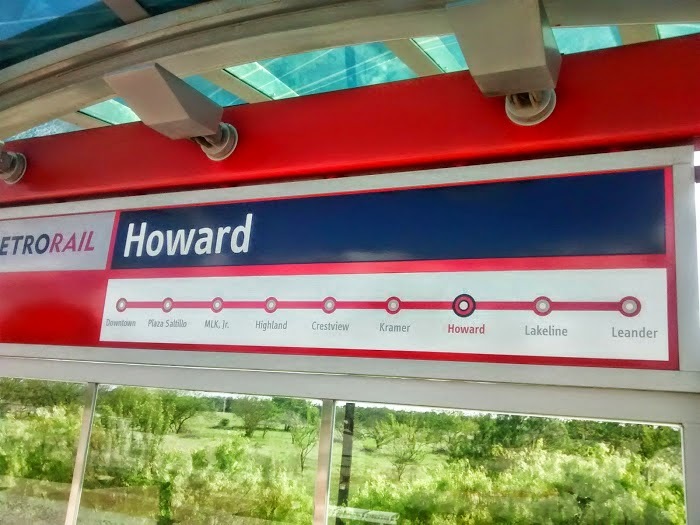 Plus, at our Howard Station, there are only two machines so if they are both in use, you have to wait your turn, have enough time to figure it all out and still hope you catch your train. For this perpetually late person, we've missed a couple of trains because we didn't allow enough time. But you know what? You can buy tickets online! I'm so doing that next time. Pro-tip: When checking the schedule online, be sure that you are on MetroRail. There are several of different tabs under the Schedules option, and I made the mistake of reading a bus schedule, loading up the kids and finding out that the next train didn't leave for five hours. My summer bucket list includes riding the train, getting off at stations other than downtown to explore what is walkable within the general vicinity of the stations. 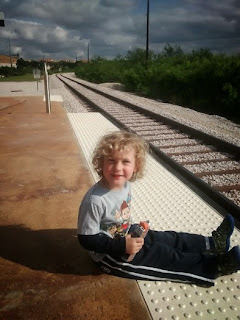 My three year old just asked today when we could ride a bus so I am thinking another journey that's in store this summer is connecting from the MetroRail onto a MetroBus! About the author: Catherine Prystup is mom to three human kids, two dogs and two cats. She's the founder of LiveMom.com, a resource website for Austin-area moms (and dads too), and the co-founder of Orange Wall Collective. She enjoys reading, drinking wine, traveling, eating, and eavesdropping in local coffee shops.